It's almost there. Really, it is. All the features we want to launch with are coded, tested and deployed behind the maintenance page. The site shows coming soon page to the public, but we have full access to the site. That's how I'm writing this blog. Lots of construction work going on behind that Turquoise maintenance page. Of course, there are lots of small things that can be fixed, but we are getting very anxious to launch. One last hurdle is the content of the site. An ecommerce software by itself is just a container. You need the content to make it come to life. For that, we are bringing over core catalog data from our old site. Now, this is not at all a straight transfer. In fact, it's more like using the old data to come up with a completely new set of catalog data. Being a programmer that I am, I am writing a program that does this. It's purpose is to run just once, creating this new data. The reason I'm doing it this way is because the volume of the data. Although we are bringing over just a subset of our catalog data, it's still well over 500 SKU's. So this is a very tedious task of writing and debugging a complicated logic, but once we get this done, the site is going to be almost live. So I mentioned about clean design in the last blog, and how hard it is. Aside from my lack of artistic talent, the really hard part is imagining the final view without all the pieces in it. For example, our categories page look like this as designed, without the backing data and images. Problem is, to come up with the blank looking layout, you have to imagine the bottom one, and how well its going to look. Sure you can create mock ups, and sometimes its easier just building a prototype of it. But you still have to have pretty good imagination. In reality, I don't have a good imagination and I'm not all that creative. So, to come up with the first blank grid, I created many working versions which were all slightly different. And in the end, I settled on the one that made the products stand out the most. It was a lot of work, but I think it paid off. I'd like to report I'm making a lot of progress. A lot of features, especially the ones that support back office order processing are in place. We are also integrating with the state of the art SASS platforms to handle shipping management, email delivery and credit card processing services. Each piece does one thing very well, but put together, it's becoming a very powerful business platform. I never would have thought this is how things are going to be 12 years ago when we started our first eCommerce business. It feels great to be in 21st century. While the software is coming together nicely, the catalog pages are proving to be difficult. The difficulty is not technical. It's the design. From very early on, I wanted a minimalistic design. Our site is about your music - you. We want you to be in a comfortable space when you are picking things out for your amp. Well, I found out the hard way, but minimalistic is really hard. I mean, really really hard. I now have tremendous respect for artists and designers who can turn out a clean, crisp and beautiful looking minimalistic design. I ended up leaning heavily on inspirations I got by looking at many, many existing designs, but I think we now have a good, clean basic design. This is what we are going to go with for launch. Hi. I'm the geek who created this eCommerce software. I was working in an office in a maze of cubicles with freezing air conditioning. I developed software that wasn't terribly exciting. So much so that I often daydreamed about how I would create Skynet, just to pass the days. Fortunately, I diverted my attention to creating this eCommerce software instead of Skynet. We all have been spared from living in the world dominated by machines. Seriously, we have been running an eCommerce site for over 10 years and we are experts at this. A whole lot has changed during that time, however. These days eCommerce sounds like some stuffy corporate business with buzzwords, charts and KPIs. For us, it's never been about that. This is about that long haired guitar guy with a Marshall stack, or a young teenager starting to learn guitar with his Fender Champ. It's about the distressed musician on tour with a broken gear. And it's about the stern looking gentleman who just bought his dream HiFi gear and hardly able to contain his silly grin. This is about people, you and me. So in creating this new site, we wanted to make sure we have a content that's something different. This blog will not be a facade for promotion and marketing. Instead, it's going to be about anything related to the site. 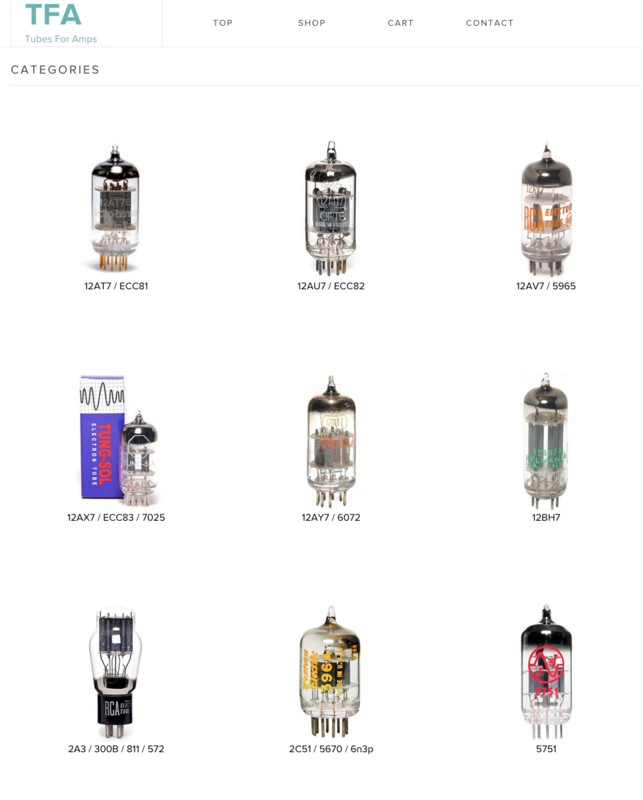 We'll cover music and gears related vacuum tubes, of course. In addition, I'll go into eCommerce and software and all the geekish things that make this tick. A backstage view, if you will.